Education began on the most intimate levels: the family and the community. With industrialization, education became professionalized and bureaucratized, typically conducted in schools rather than homes. Over the past half century, however, schooling has increasingly returned home, both in the United States and across the globe. This reflects several trends, including greater affluence and smaller family size leading parents to focus more on child well-being; declining faith in professionals (including educators); and the Internet, whose resources facilitate home education. In the United States, students who are homeschooled for at least part of their childhood outnumber those in charter schools. Yet remarkably little research addresses homeschooling. 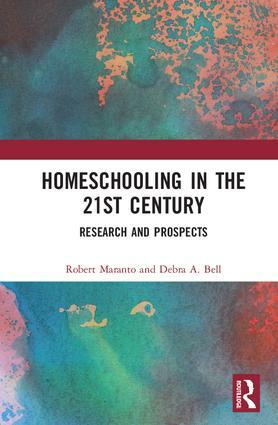 This book brings together work from 20 researchers, addressing a range of homeschooling topics, including the evolving legal and institutional frameworks behind home education; why some parents make this choice; home education educational environments; special education; and outcomes regarding both academic achievement and political tolerance. In short, this book offers the most up-to-date research to guide policy makers and home educators, a matter of great importance given the agenda of the current presidential administration. The chapters in this book were originally published as articles in the Journal of School Choice. Robert Maranto is the Twenty-First-Century Chair in Leadership in the Department of Education Reform at the University of Arkansas, USA. He also serves on the boards of the Fayetteville Public Schools and Achievement House Cyber Charter School. He is the editor of the Journal of School Choice. Debra A. Bell is Executive Director of Aim Academy, which provides college-prep classes online for homeschool students. After homeschooling her four children K-12, she completed a PhD in Educational Psychology at Temple University, USA. She is the Vice-Chair of the Global Home Education Conference.